School funding and fundraising: your opportunity to weigh in! Posted on February 14, 2014 by rpnorton | Comments Off on School funding and fundraising: your opportunity to weigh in! Later this morning (Friday, February 14, 2014) I will be a guest on the Forum show on KQED radio (88.5 FM in the Bay Area). Do you have thoughts on school funding and fundraising? This is your chance to call in. The topic of the program is a recent series of articles by the SF Public Press on disparities in PTA fundraising in SFUSD. The series is extensive and worth reading, but the gist is that the paper’s analysis found that a handful of SFUSD schools more than made up for budget cuts through parent fundraising during the budget crisis over the past few years. I don’t dispute that finding, generally, though I do have some issues with the analysis (it’s not clear, for example, whether the reporting took centrally-funded services like special education teachers and aides, social workers and nurses into account). I think the article is an important opportunity to look, in general, at education funding in California and to have a discussion about what educational elements are essential for every child in our community? On February 14, 2014, you will be able to call in to the Forum program at 1.415.553.2227 or 1.866.SF.FORUM (1.866.733.6786) or email forum@kqed.org to have your thoughts registered in the discussion. You can listen live at 88.5 FM or at this link. After the program has aired, you will be able to listen to archived audio. Comments Off on School funding and fundraising: your opportunity to weigh in! Remember when I wrote that SFUSD is over-using the California Modified Assessment for students? Turns out it is a statewide problem, according to an article in the Sacramento Bee last weekend. The article was prompted by complaints from Doug McRae, a retired administrator with the California Department of Education. In 2007, San Diego commissioned a review of its special education programs, just as San Francisco did three years later. Voice of San Diego has now launched an in-depth investigation into San Diego’s move toward inclusive practices — much the same transition we are trying to initiate here in SFUSD. The first installment in the multi-week series indicates the work in San Diego has been rocky — general education teachers haven’t received as much training or support as many feel they’ve needed, while some special educators have been frustrated by what they see as their colleagues’ unwillingness to change. It’s very useful to have the lessons of San Diego so that SFUSD can hopefully avoid the worst pitfalls. There were also some great blog posts/news articles about how the late Steve Jobs created technology that has really benefited children with disabilities, particularly the iPad. This one, by Tim Carmody in Wired, is the best. Finally, hot off the presses, Governor Brown came through and signed SB 946 (Steinberg), which introduces a limited mandate for health insurers to pay for autism treatment — at least until the Federal health care bill is fully implemented in 2014. This is great for families who have been struggling to pay for autism treatment, or fighting with their insurance companies because autism treatment should already have been covered by California health insurance policies under AB 88, the state’s mental health parity law. It’s a big step forward and should provide the state budget with some relief, because schools and regional centers will no longer be the payers of last resort for autism treatment. Today’s Examiner article on disproportionality in SFUSD special education classrooms is worth reading. This is not a new issue but the problem persists and it’s important to keep attention focused on making sure we assess all kids impartially, in all areas of suspected disability, rather than succumbing to preconceptions. The New York Times Magazine has a whole issue focused on education – there’s a great article by Clifford J. Levy on his children’s “full immersion” experience in a progressive Russian school; the excellent Paul Tough cover piece examines characteristics that breed success in school — and whether they can be taught to children who aren’t fortunate enough to be born into homes where those characteristics are absorbed naturalistically. The Times also has a lovely article about an autistic adult’s transition to a “real” adult job, with the help of a community transition program at his local high school. In SFUSD, our Community Access/Transition (CAT) classrooms fulfill this function for students who don’t have the abilities necessary to be successful in college. (This week I had the honor of serving on an Arts Education panel with CAT teacher Heidi Hubrich and general education teacher Keith Carames (“Mr. C”), talking about the great inclusive work Ms. Hubrich and Mr. Carames are doing at the Ruth Asawa School of the Arts). A week or so ago I had a pleasant coffee with Kristina Rizga, a reporter for Mother Jones who is embedded at Mission High for the year. She’s been writing regular dispatches from the ground, and doing a great job capturing life at an inner-city high school. I’m particularly interested in her upcoming post about watching “Waiting for Superman” with a Mission teacher and his students, and the discussion about the movie. I was kind of amazed to tune in recently to a controversy that has apparently been going on for quite a while in Atlanta Public Schools. The city’s nine-member school board has been wracked with infighting and factionalism that culimnated in a kind of a coup late last fall — the Board quietly changed its internal rules that had previously required a two-thirds majority to elect a chair, instituting instead a simple majority requirement. You might guess what happened next: A five member faction quickly voted in new leadership, and the four members in the minority cried foul. The case went all the way to the state attorney general, with board members asking for a definitive ruling on who actually had the power to chair the board. In the meantime, the district was rocked by a cheating scandal and the long-serving and highly-regarded Superintendent, Beverly Hall, announced plans to retire. Last week, one of the nation’s largest accreditation agencies threatened to pull the district’s accreditation if the school board could not get its act together and govern the district appropriately. (Read the agency’s highly critical report here). What is most interesting to me is that board elections have long been influenced by an organization called “EduPAC,” which was begun by the Atlanta Chamber of Commerce almost two decades ago. Indeed, eight of the nine current board members were endorsed by EduPAC, which boasts a wide membership of business leaders, civil rights leaders, parents and other active community leaders. In Atlanta, EduPAC is the biggest endorsement there is when it comes to school board races. There have been times where I have thought our own school board was dysfunctional, but when I read stories like these, I realize that we are lucky here in San Francisco to have missed out on what true dysfunction looks like. Apparently there was some sort of announcement today about a plan to merge Buena Vista Elementary (a full Spanish immersion K-5 school) with Horace Mann Academic Middle School. I am not quite sure what has been publicly announced, but I have been aware of these discussions and have told the Superintendent that I am supportive of the outlines of the plan. My understanding is that current Buena Vista K-5 students will move to the Mann campus, turning the school into a full Spanish immersion program for students in grades K-8 (Buena Vista’s Pre-K program will remain at the existing site for the time being). I also believe additional Spanish Immersion seats will be opened up for 6th graders so that students from other K-5 immersion programs will be able to choose Horace Mann for middle school. That’s about all I know. Once more information is available, I’ll post it here. Last week I was invited to a screening of “Waiting for Superman,” a new education documentary that has attracted a lot of attention — it should be released in theaters in late September. 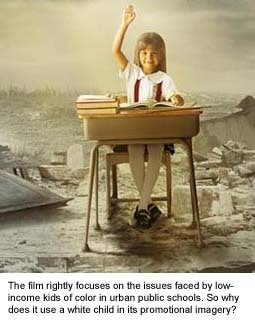 2010 seems to be the year of the “edumentary,” with several films documenting various problems in the U.S. educational system. I’m torn about how I feel about “Waiting for Superman,” which is the highest-profile of the year’s documentaries. Made by Davis Guggenheim, a filmmaker who won an Oscar for the climate documentary “An Inconvenient Truth,” it’s entertaining, with great characters and subject matter that I, at least, find riveting. It’s an open question whether the moviegoing public will find education reform as compelling as melting polar ice caps, but based on the early buzz and the reactions of the audience I saw, it should do well. The man sitting next to me actually cried out in disbelief at several points; as the lights came up, many people pulled out their cellphones to text the word “Possible” to an address displayed on the screen. (Some kind of pledge to recommend the movie to friends, I think).